Cotonou (Agenzia Fides) – “We are in urgent need of food and medicine to help the population affected by the floods,” Sister Léonie, Secretary General of Caritas Benin, has told Fides. “We have so far registered 846 cases of cholera, 7 of which have been lethal. There are also cases of malaria and diarrhea. We need medicines to treat this disease, as well as insecticides and safety nets against Anopheles mosquitoes,” says Sister Léonie. According to the UN Office for Humanitarian Affairs, floods in West and Central Africa have killed at least 400 people and affected half a million people since the beginning of the rainy season in June. 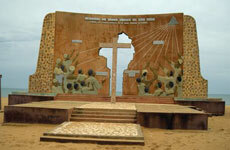 Our picture shows the monument built to mark the place where the first SMA missionaries arrived to evanglise this part of west Africa. If you would like to respond to this appeal please send what you can to Rev Editor (Benin), African Missions, Blackrock Road, Cork. All proceeds will be sent to Caritas Benin. Thank You!